For those who are shocked about Speaker Ryan’s selfie, I’m a bit confused as to why? If you are a person of color, particularly a person who holds even an introductory leadership position, this shouldn’t be surprising. The lack of diversity in the halls of power are overtly obvious for those who will simply take a look. Here are 3 reasons why Speaker Ryan’s selfie does not surprise me. This is how it’s always been. When I stepped on campus of my liberal arts, private university I couldn’t help but notice the lack of diversity. Granted, this was over a decade ago (yikes! ), but I can say that in the adult world, institutions of higher education and leadership are still predominately white. It was a surreal feeling, here was this quaint campus nestled in the midst of a bustling, very diverse city and yet, those within the campus -for the most part- were not of the city. If you’re still not convinced, just search “[insert company/institution of your choice] leadership” and click the ‘image’ tab. Let me know what you find. “It’s not what you know, but who you know”. That saying is particularly relevant if you are trying to to climb the proverbial ladder of success. 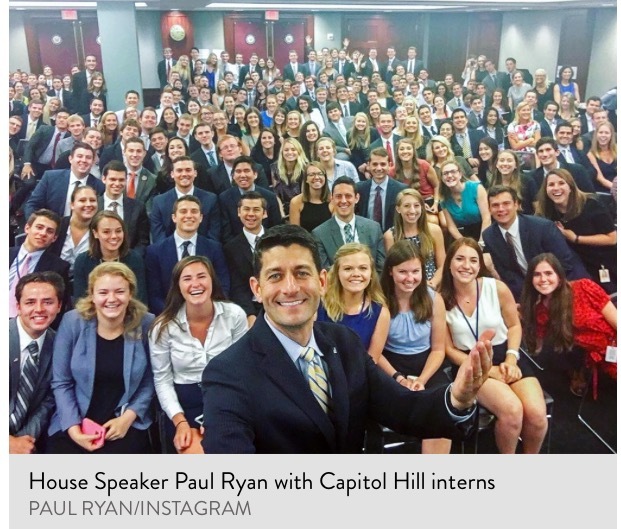 How many of those pictured interns have parents who work the system themselves? It is not even a matter of being someone who pulls strings to get your child an internship, but simply making the opportunity available, or obvious to pursue, is something to consider. How many children of color are even aware that such opportunities exist? And even if the opportunity was made available, would children who revolve outside the 1% afford such an opportunity? 114th Congress is the most diverse Congress – and that really says A LOT. It says a lot for all the wrong reasons. It says a lot about a nation that has come a long way, but not enough for its people. It is not enough to claim the 13th amendment, abolish real chains only to create invisible shackles all around us. It is a bit ironic that the internet has gone wild over this Congressional intern image, when all the internet has to do is look at an image of the current 114th Congress. 80% of the 114th Congress is male and white, and that’s the most diverse it has ever been. Graph courtesy of the Washington Post. My middle school in urban Philadelphia was a mix of Black, Hispanic, White, Arab, and Asian. That is what I thought America looked like until I stepped into my university. I thought maybe this was the exception. However, increasingly that image faded as the color from these spaces faded as well. In my graduate program, I can possibly count the people of color who are in my classes on my fingers. Educator workshops also predominately white. The Mock Trial Competition for our county, predominately white. Spaces of power and critical thinking are made exclusive to those who are offered the opportunity to partake in them. These are the spaces where majority rules, in more ways than one. Previous Who is Running the Show? This is quite alarming considering large minority groups are being under represented. This also tells me why I see race and politics play a huge factor in work environments and politics. There is an organization called United Voices for America, which is a civic engagement organization. The mission of this organization is to change the political direction by introducing people of color to politics, and to ensure that all citizens have a seat at the table. Organizations like these help create a balance in society. Being actively involved is a start, but lasting change might surely be slower then we expect. You are absolutely right, it is alarming. However, those who are minorities are not surprised at the lack of diversity in leadership positions. Simply go to a leadership conference in almost any capacity and look around. I know there are many organizations that are conscious of this and work to promote diversity, but it is tough when our own government is still pushing back against diversification, even when we have an African-American President!